Last week, I went to a high school and talked to three different classes about my upcoming PCT thru-hike.I had spent a few weeks putting together my PowerPoint presentation covering the who, what, when, where and why the hell would I hike all the way from Mexico to Canada all by myself details to share with the kids. 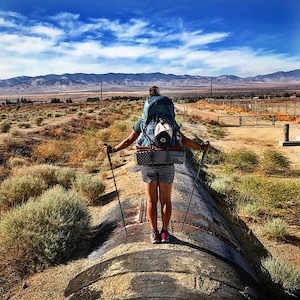 I was super excited to introduce them to the Pacific Crest Trail, share with them how much planning and preparation I had put into making my trip a reality, show them the gear I’d be bringing with me on the trip, lead them through a little bit of yoga and give them bags of trail mix when I started talking about what I’d be eating on the trail. Even though I was super excited to do these presentations, I didn’t realize how nervous and anxious I was going to be giving these presentations until the morning of my visit. No matter how prepared I was, I couldn’t shake these anxious and nervous feelings. High school kids are intimidating! As soon as I got on campus, all of those feelings of being an awkward high school kid over 20 years ago came flooding back to me. Would they be interested in what I had to say? What kinds of questions would they ask me? Would they like me? Would they make fun of me? I stopped in the middle of the hallway and took a couple deep inhales and exhales. Almost instantly, I could feel the nervous, anxious jitters fade away. The excited feelings started coming back because I realized I was about to share something so close to my heart, my passion, with kids who might possibly get inspired to go outside and experience their own hiking adventures one day. In my yoga classes this week, I shared this experience with my students and encouraged them to tap into their Pranayama during class. Our Pranayama is a super power we all have access to whenever we need it. If you ever find yourself feeling nervous, anxious or just feel off, focus on your breath. If you’re working really hard physically, whether it be in a yoga class, outside running or in the woods hiking, tap into your Pranayama, one inhale and one exhale at a time. All you have to do is breathe.